Martial Arts is a great way to get in shape, lose weight, learn self defense, and have fun without enduring a typically boring exercise program. Oftentimes, when people set about trying to get in shape they try many different things with disappointing results. We always seem to find a reason not to make the time to do something that is important for our health. We have good intentions. We know we need to exercise. But, it seems everything we try gets old and boring pretty fast. The gym membership gets wasted. The video tapes you ordered are collecting dust somewhere. How about that exercise machine you bought that turned into an expensive clothes rack (before it ended up in a garage sale). 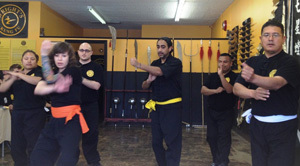 The solution is the adult program at Wright's Kung Fu. For any physical conditioning program to work (mentally and physically) you need to stay with it for extended periods. Problem is most things that adults do to stay active are just plain boring. 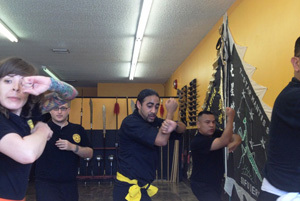 Kung Fu offers a structured program in which the student is constantly learning new material. There are a lot of approaches to teaching martial arts. 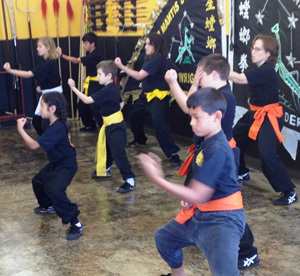 Some schools are very strict and traditional, while others are kind of like a playground for martial artists. They do not have much in the way of respect or tradition. We believe that the best learning situation is somewhere in between, a relaxed and friendly learning atmosphere. We do believe in and follow a certain amount of the Far East tradition associated with martial arts. We value honor, courtesy, and respect. Our Instructors are trained to give each student attention so that you make steady progress and continue to grow and improve. We get to know your strengths, weaknesses and motivation. With many years of combined experience, our instructional staff is focused and is able to meet even the most challenging situations. Call or email us in advance to schedule your FREE trial lesson.